Heather Cubbage finished her season in style with a brilliant performance for Great Britain in the Manchester International. The talented City of Portsmouth thrower was selected for the GB under-20 team for the discus and showed her class on the big stage with a fantastic new personal best of 46.59m. Also she ended the summer ranked UK number one for her age group. She said: ‘The Manchester International was the best competition of my life, it was an amazing experience and it was so inspiring to compete with athletes that I have looked up to for the whole time that I have been throwing. ‘I was so excited leading up to the competition and was really pleased to have thrown a personal best at the biggest competition of my career so far. Her big successes in 2018 included the English Schools discus title, gold in the South of England Championships and the Hampshire Championships. 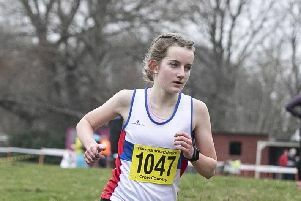 Cubbage added: ‘There was ups and downs in the season but I am happy to have come away with the under-20 UK number one ranking, to have retained titles and to have improved my personal best despite it being my first year in the age group.